Being on something of a fantasy jag lately, I did one of those things where you look at a figure in a store for months and months and months and finally break down and buy it. 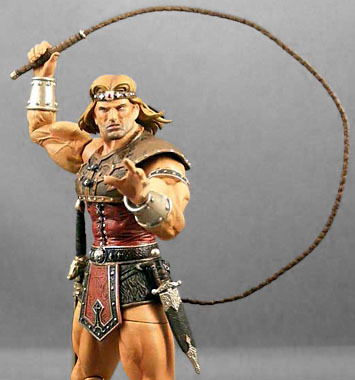 In this case it was for NECA's Simon Belmont from the Castlevania series of their Player Select line. I decided to pick up Simon because he looked like a cool barbarian figure - not so much Conan as Kull, another Robert E. Howard character. The clincher was all the articulation and accessories. By defeating Dracula, Simon fulfilled the Belmont legacy. However, this was a ploy by Dracula, who sacrificed an early resurrection to lay a curse upon Simon - a curse that could only be broken if Simon found Dracula's body. Despite efforts by Dracula's minions, who hid parts of his body all over Transylvania, Simon located all the pieces. He then resurrected Dracula once more, fought him, and defeated him, breaking the curse. Simon comes in NECA's standard narrow clamshell packaging. The graphic design, by Jon Sprance, is a bit dull, particularly on the back, which is just photos of the figures themselves, with no information about the character or even the games. For the record, I don't know anything about Castlevania. I vaguely recall playing the original NES game when I was seven or eight. I think this line is based on that game, or maybe NECA just picked and chose from among the various incarnations, since Alucard wasn't in Castlevania. 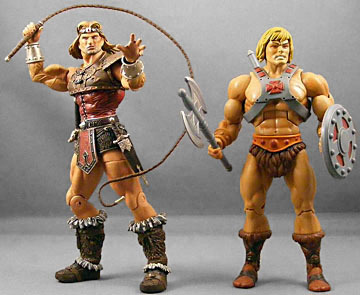 There's not a lot of reference material for Simon Belmont, so NECA appears to have based on the sculpt on the original NES cover art and then, since the art only shows the character from the back, extrapolated the rest of his look from that. The sculpting on the body and clothing is excellent, easily on par with the best we've seen from NECA. The amount of detail is astounding, from stitching of his loincloth to the texture of the hide leather in his outfit. However, his face... I suppose we don't know what Simon Belmont's face actually looks like, but apparently NECA decided he was an ugly dude. NECA's paint on its Player Select and Cult Classics line has been spotty at times, but it's very sharp here. They've finally gotten a great fleshtone look and feel. The detailing is sharp around the loincloth and lower torso, though the paint is just a tiny bit splotchy on the chest. The head, or more specifically the face, probably has the weakest paint work - it looks like the head was intended to have very sharp lines, but between the production process and the somewhat sloppy paint the edges were somewhat lost, particularly around the mouth and jaw. NECA should be commended for their continuing efforts to add well-hidden articulation wherever they can. To help him break his family's curse [spoiler warning: it doesn't take. --ed. ], Simon has a balljointed head, balljointed shoulders, balljointed ankles, balljointed upper torso, balljointed wrists, swivel biceps, swivel elbows, swivel thighs, hinged knees and a v-crotch. Overall I'm pleased with the articulation, with two exceptions: the V-crotch and the swivel elbows. The V-crotch is somewhat mitigated by the swivel thighs and the fact that the loincloth restricts a lot of the hip movement anyway, so there's only so much you could have done had they been balljoint hips. But I don't get why they went with the swivel elbows, particularly since they already had the hinged knees. Swivel elbows never look quite as good when moved out of their sculpted position. Also, the pegs holding the arms are loose, and the forearms tend to pop off pretty easily. My guess is that the tooling for hinged elbows was just outside NECA's production cost estimate for this figure. Simon comes loaded with accessories. 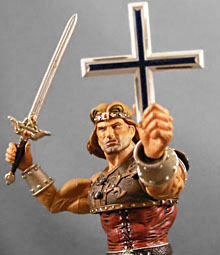 In addition to his iconic whip, he comes armed with a sword, a dagger, and a flail, as well as an alternate left hand, one to hold a weapon and one to recreate the iconic pose from the cover art. The outer cover of the dagger sheath on my figure came off the first time I took out the dagger, but it was easily fixed with some glue. He also comes with a jar, a cross (which doesn't appear to be a Christian cross), and a pair of candles. I have no idea what these are supposed to be - perhaps a Castlevania fan could enlighten me? While I can't say I have any real attachment to the character, he's a great generic barbarian hero-type, and will look good alongside Kratos, Altair, Marcus Phoenix Fenix and other NECA videogame figures. 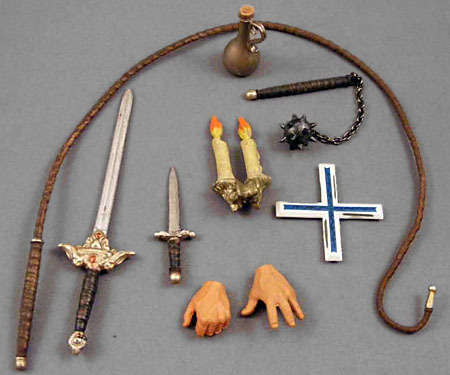 His assortment of weapons and accessories are great, too. In looking at this figure, there's one thing I keep coming back to: here but for the grace of Mattel goes MotU Classics. 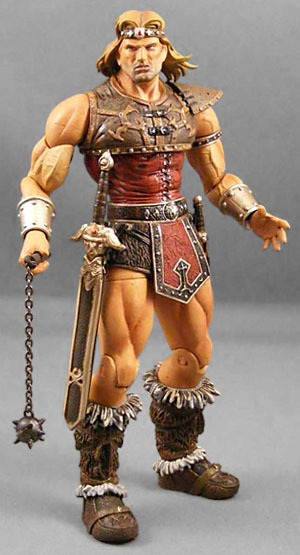 As much as I love MotU Classics, I loved the 2002 designs too, and a line of MotU figures with the level of detail and articulation as Simon here would be incredible. But at what cost? Hard to say. I paid $17 for Simon, but NECA has a tiny fraction of the overhead Mattel does (balanced somewhat by economies of scale). He's still an ugly dude, though.